I leverage (or risk!) my good reputation to help inventors whose braking or other safety-related technologies may bring more people to the sport. DXS: I call this my dream brake. The adult prototype I tested cut my stopping distances in half. A 9-year-old mastered the youth version in 90 minutes. Find out and how the DXS could benefit skaters, inline instructors and the industry. See the DXS in action on YouTube. Also: A comparison of braking technologies I've tested. 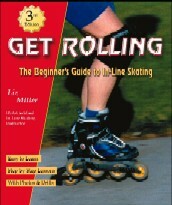 Follow the Get Rolling blog or explore years of Orbit newsletter archives here.